Kate Middleton makes glamorous appearance in Self Portrait dress at A Street Cat Named Bob premiere | HELLO! 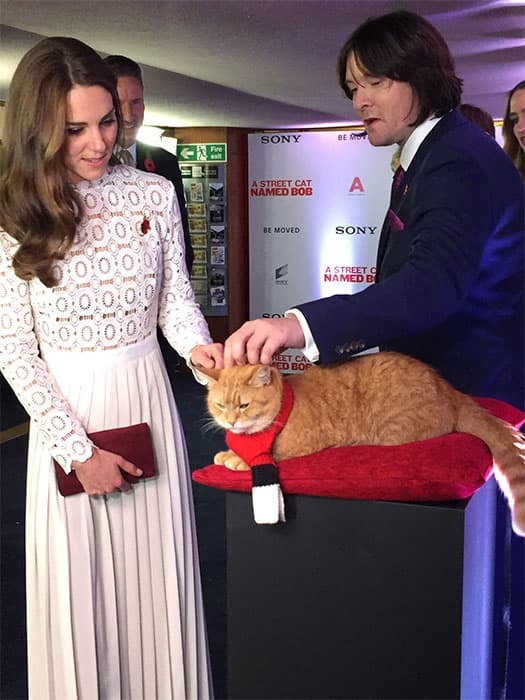 The Duchess of Cambridge, née Kate Middleton, pulled out all the stops for her appearance at the premiere of A Street Cat Named Bob on Thursday evening. The 34-year-old dazzled in a white dress from Self Portrait as she stepped out for the event at the Curzon Mayfair cinema in London. Kate paired the £320 long-sleeved fitted dress with a clutch bag and a poppy pin. She wore her hair in her signature glossy blow dry and completed the look with smoky eye make-up. The Duchess was attending the premiere in her capacity as patron of Action on Addiction, the charity that helps those suffering from problems of addiction. The mother-of-two has been a member of Action on Addiction since 2012. The charity works across the addiction field in treatment, professional education to honours degree level, support for families and children, research, and campaigns.